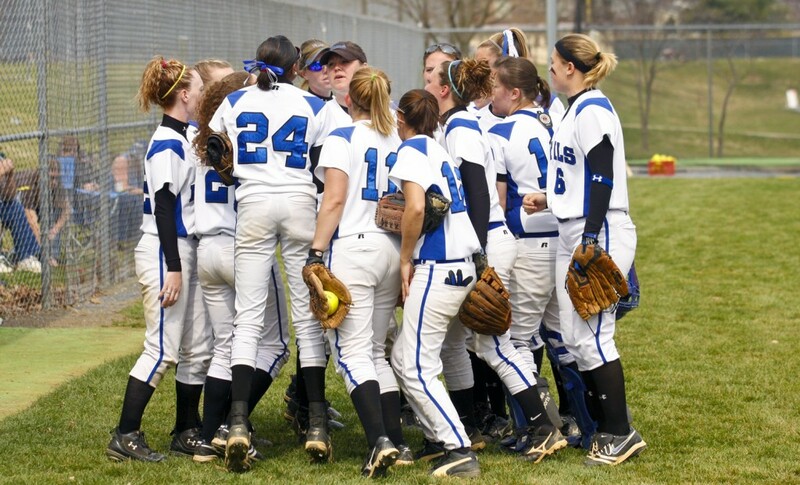 The softball team finished the 2011 season with the second-best record in EMU history at 27-13 and the best record ever in ODAC play at 14-4. They set team marks for most hits (386), runs scored (287), homeruns (39), RBIs (266) and slugging percentage (.521). SEASON PREVIEW: Getting Even Better? Last spring, the EMU softball women broke 12 program individual or team records, including eight offensive marks. Despite the loss of three starters, this year’s team could be even better. In 2011, Eastern Mennonite set team marks for most hits (386), runs scored (287), homeruns (39), RBIs (266) and slugging percentage (.521). The team finished with the second-best record in EMU history at 27-13 and the best record ever in ODAC play at 14-4. The Lady Royals took the top seed into the ODAC Tournament but were knocked out late on day two of the three-day, double elimination tourney. To make a postseason run this year and claim just the third ODAC Championship in program history, McCurdy needs his returners to continue to improve. High school teammates Brooke Hensley (Elkton, VA/Spotswood) and Molly Smith (Elkton, VA/Spotswood) were each named to all-region teams last spring as freshman. Smith led EMU with 40 RBIs, 14 doubles and 55 hits as the outfielder earned NFCA All-Region (Atlantic) Second Team honors. Hensley was a defensive general at shortstop and led the Lady Royals with a .441 batting average. She was named All-Region Third Team. Lisa Lee (Buckingham, VA/Buckingham County) earned All-ODAC First Team honors as the ODAC Pitcher of the Year, and was a star in the circle and at the plate. She was 19-7 with two saves as a pitcher, charting a 2.24 ERA and breaking the EMU season records with 19 wins and 165-2/3 innings pitched. She was also second on the team with seven homeruns and led the way with 42 runs, 18 walks and 15 stolen bases. Other All-ODAC performers include: All-ODAC First Team designated player Sara Jenkins (Stanley, VA/Page County) (.364, 4 HR, 21 RBI), All-ODAC Second Team catcher Rasheeda Crews (Brookneal, VA/William Campbell) (.395, 1 HR, 14 RBI), and All-ODAC Honorable Mention second baseman Courtney Allman (Mt. Solon, VA/Fort Defiance) (.286, 8 HR, 30 RBI). McCurdy also returns three other players: Megan Viafora (Stanley, VA/Page County) (.300, 4 HR, 18 RBI), Rachel Breeden (Shenandoah, VA/Page County) (.304, 1 HR, 7 RBI), and Katarina Napfel (Berkeley Springs, WV/Berkeley Springs) (.500, 17 R). The incoming class of freshmen Jordan Aylor (Madison, VA/Madison County) and Taylor Sellars (Powhatan, VA/Powhatan), while not very deep, is quite talented. With so many of the bats returning, as well as both pitchers (Lee and Smith) and newcomer Aylor, McCurdy feels his team can make some noise this year. “A great offense and strong circle will help us stay competitive with every team we play,” he said. The Lady Royals were tabbed to finish second in the ODAC Preseason Poll, behind ODAC Tournament Champion Virginia Wesleyan, but McCurdy is indifferent to the preseason prognosticators. EMU’s coach is simply excited for this season. If history is any indicator, the women should be able to mask their flaws. Last year, the Lady Royals out-hit their opponents .346 to .267 and smacked nearly three times as many homeruns as they gave up (39 to 14). Eastern Mennonite will get a big challenge as they continue their 2012 season this weekend at the Beach Blast in Virginia Beach, VA. The women will take on two teams ranked in the NFCA national preseason poll, No. 3 Christopher Newport and No. 8 Salisbury. McCurdy says these tough non-conference games will prepare his team for their ultimate objectives.